The name of this instrumental confab, assembled by Marc Free of Posi-Tone Records, suggests both a whimsical nod to marital customs and a callback to hard-bop’s heyday. It also formed a sort of guideline, as Free set out to incorporate something old, something new and something borrowed into the picture — all the while shining a light on his label’s swinging roster. The “old” refers to Posi-Tone veterans pianist Art Hirahara, drummer Rudy Royston and bassist Boris Kozlov. (Sorry, guys.) Representing the “new” are the younger musicians who make up a front line: alto saxophonist Alexa Tarantino, tenor saxophonist Sam Dillon and trombonist Nick Finzer. As for the “borrowed” element, Free asked the players to construct their repertory in part from previous releases on the label. The opening track is a composition by vibraphonist Behn Gillece, originally heard on a 2013 album he made with saxophonist Ken Fowser. And what about the part involving the band name? A few bars of “Slick” should answer that question. Now how about something old that still sounds new? This is an alternate take from Iron Man, an album by alto saxophonist, bass clarinetist and flutist Eric Dolphy, recorded in 1963 and released five years later on an independent label. Among other things, this marks the recorded debut of trumpeter Woody Shaw, who was 18 at the time of the session. The personnel also includes Bobby Hutcherson on vibraphone, Richard Davis on bass, and Clifford Jordan on soprano saxophone. We originally premiered this track last fall, in a feature article about the 10th anniversary of Resonance Records. Now the full archival release, Musical Prophet: The Expanded 1963 New York Sessions, has been issued on CD. 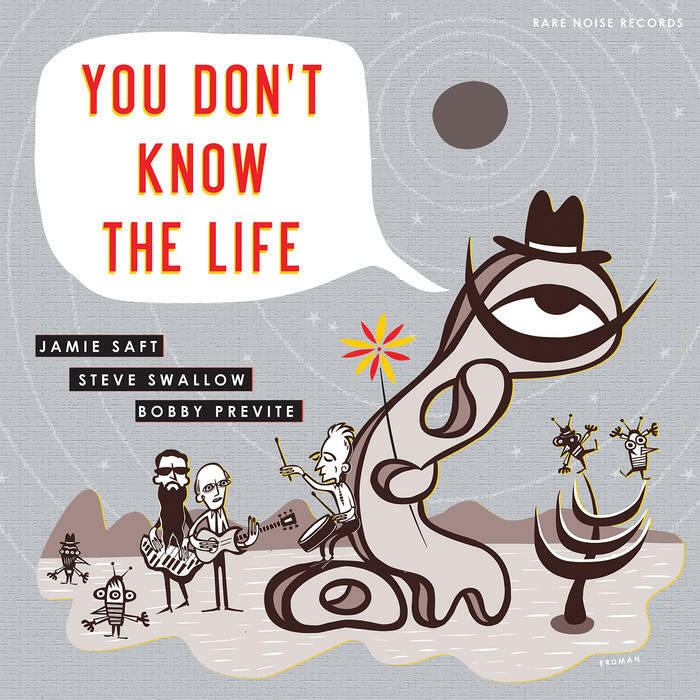 Here is a new group borrowing an old tune: Saft, the inveterate keyboard omnivore, calls upon two first-rate partners, electric bass guitarist Steve Swallow and drummer Bobby Previte, on a new album, You Don’t Know the Life. Just out on the RareNoise label, it encompasses deep-groove hypnosis and spacey abstraction, with an underlying emphasis on selfless group cohesion. And along with two Saft originals and a few collective improvisations, it includes pieces composed by Bill Evans, Burt Bacharach and Roswell Rudd. The title track, one of the unlikelier sources, was originally recorded in 1968 by the Moving Sidewalks, a Texas psychedelic blues-rock band best remembered today as an early springboard for guitarist Billy Gibbons (of later ZZ Top renown). “You Don’t Know the Life” is a disaffected ballad by the keyboardist in the band, Tom Moore, whose organ hum is faithfully recaptured by Saft, at a slightly slower tempo. Maybe this stretches our premise a bit, but Jon Lundbom’s Big Five Chord is a resolutely new band that often calls back to an old sound. Their new album, Harder on the Outside, releasing this Friday on Hot Cup Records, is the latest manifestation of a knockabout rapport between Lundbom, a smartly unruly guitarist, and Bryan Murray, a saxophonist and producer. Rounding out the group are saxophonist Justin Wood, bassist Moppa Elliott and drummer Dan Monaghan. The album opens with a Lundbom piece called “People Be Talking,” with a tick-tock funk groove and a melody scored for a double-helix of alto and tenor saxes. This setup soon dissolves, as Murray takes a tenor solo rooted in the woolly protocols of the loft-jazz era. Lundbom’s turn in the spotlight assumes more liquid properties, as the tempo destablizes around him. The whole arc, contained in just under eight minutes, conveys the rangy gusto inherent to this crew. On to something entirely new: Pedro Martins is a guitarist, composer and singer from Brazil, still just in his mid-20s. He has earned the enthusiastic approval of Kurt Rosenwinkel, whose Heartcore label will release an album by Martins, titled VOX, on Feb. 8. “Faces” is the first taste of that recording, and it rings with promise. Martins has made a close study of Milton Nascimento, and he incorporates that vocal and harmonic style along with state-of-the-art jazz guitar. Toward the end of the track, saxophonist Chris Potter makes a featured cameo — though the main attraction remains the otherworldly-yet-familiar sound hat Martin creates.